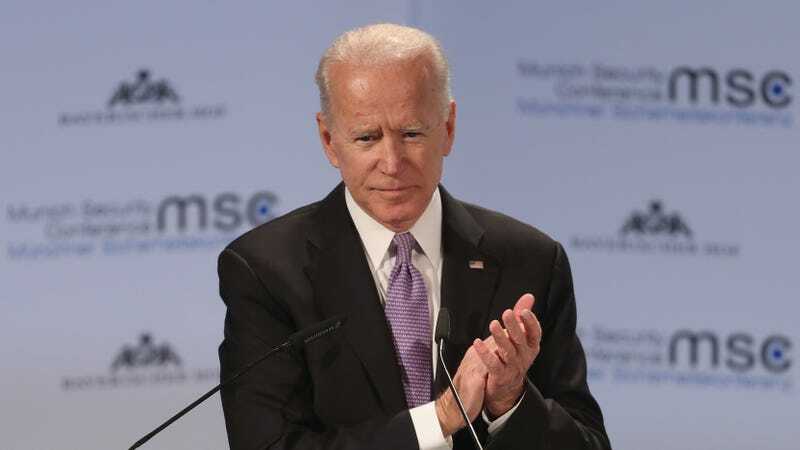 Former vice president and rumored 2020 primary contender Joe Biden released a video Wednesday afternoon addressing what several women have recently come forward to address: his habit of getting very touchy with women. Biden goes on to say that he’s never been one to consider politics “cold and antiseptic” and that his affectionate approach is just who he is. However, he acknowledged that he has clearly made people uncomfortable. “Social norms have begun to change,” he continued. “They’ve shifted, and the boundaries of protecting personal space have been reset, and I get it. I get it. I hear what they’re saying. I understand it. And I’ll be much more mindful. That’s my responsibility. In the wake of former Nevada assemblywoman Lucy Flores’s claim that Biden smelled her hair and kissed the back of her neck at a campaign event in 2014, more women have come forward with stories of the former vice president being a little too handsy. Writer Amy Lappos says Biden rubbed noses with her at a fundraiser in 2009, writer D.J. Hill says his hand moved from her shoulder to her lower back while taking a photo with him at a fundraiser in 2012, and activist and sexual assault survivor Caitlyn Caruso alleges he rested his hand on her thigh during a college event about sexual assault. The extent to which social norms have changed in Biden’s lifetime may be arguable—I personally feel like I’ve been having a version of this conversation my entire life. The change has only “begun” for men who never had to listen before.